When the real estate bubble burst in 2007 followed by the taxpayer bailout of those who created the problem in the first place, we watched most of the equity in our home disappear overnight. When the stock market tanked in 2008, our 401K took a big hit as well. It dawned on us that unless we changed our investment strategy immediately, our retirement years would be spent repeating the question; "Do you want fries with that?" So we went online and started learning about investing the little we had left, in something more tangible than paper stocks. We noticed that many of those investing in precious metals were also involved in the "prepper" community. Rather than a cult of tin-foil-cap wearing "weirdos", which is what we expected after years of watching mainstream news and TV, we connected with a large and growing community of real Americans who shared our concern for a comfortable retirement and a viable future for their children. That's when we decided to get "ready for anything". After months of scouring alternative news websites, listening to internet talk radio, reading "prepper" blogs and research about self-sufficiency, we came across "Homeland Security Radio" on GCN (Genesis Communication Network), hosted by Roger Fredinburg. He has some very interesting guests and the discussions are always spirited and helpful. Roger seemed to be speaking from the heart when he mentioned one of his sponsors; Food Storage Guys. We had recently completed our research and had been shopping around for long-term food storage, so when the program was over, we visited this site. It didn't take long to see why Roger recommended Food Storage Guys. 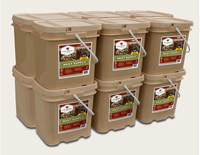 We had browsed at least a dozen "food storage" websites before this, but none of them offered the selection, the lowest price guarantee and free shipping. There's also lots of helpful information and sound advice throughout the site. We began by clicking the "Start Here" link on the home page and following the simple instructions for navigating the Food Storage Guys website. That's when we noticed the "Food Calculator". It's an easy to use tool that helps you zero in on exactly what you need. First, we had to enter our diet type. The choices include; Meat, Vegetarian, Vegan and even USDA Certified Organic. Although we normally try to buy organic when there's a choice, we were unable to find organic quick-fix meals anywhere. Food Storage Guys has an organic supply but it requires a little more preparation than the quick-fix meals and during a short term emergency we want something that's easy to prepare. The organic bucket is more useful when food supplies are disrupted for a longer period of time. We are definitely meat eaters as is our son, but our daughter and son-in-law prefer a vegetarian diet. The Food Calculator makes it easy to figure out the needs of mixed diet families such as ours just by running the calculator as many times as needed. 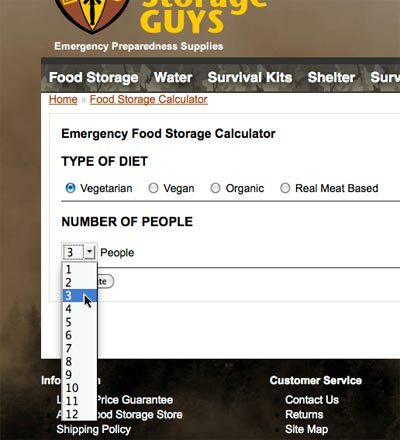 The second variable we entered in the Food Storage Calculator was the number of people we would feed with our food storage plan. We decided to store enough food for ourselves, our two children and our son-in-law. They're all in their twenties and just starting careers in this dismal economy, so we know they don't have the time or resources to prepare for the tough times that seem to be on the horizon. Our daughter is expecting our first grand-child in a few months so we figured we better get enough food for at least six people. We had to think about baby food too. We ran the calculator twice. Once for 3 people with a "Vegetarian" diet (as pictured) and then for 3 people with a meat diet to find the recommendations for both. By doing it this way, we can satisfy both the meat eaters and the vegetarians in our family and end up with greater variety to boot. Finally, we had to choose the duration of our food supply. After all we had learned, we understood that a two week food supply would be enough to get through a temporary emergency or disaster but would be woefully short if other, more prolonged, disaster scenarios occur. We weighed our needs against our budget and decided that having enough food to last for six months would be prudent. If there's a major catastrophe that disrupts the food supply chain for longer than that, we'll have a chance to get a garden planted and harvested before our supply runs out. After entering these numbers into the Food Calculator, it returned several Primary Food Supply results. Each result was for three 1-year, food supplies. That's enough food to feed six people for six months. After comparing calories-per-day and cost, we decided to mix it up a little so we would have the most variety. The Wise Vegetarian product consists of quick-fix meals in pouches. These would be perfect for short-term emergencies or disasters as the preparation is simple, just add boiling water, wait 15 minutes and you have a healthy delicious meal. The Saratoga Farms / Mountain House product comes in #10 cans and consists of both quick-fix meals and cooking staples that can be prepared using our family recipes. We found greater variety in the #10 cans than the quick-fix meals in pouches. This food supply also includes meat dishes so the meat eaters in our family will be satisfied and it's a simple matter to puree some of the fruits and vegetables to make baby food. The Food Storage Guys Vegan product consists of healthy vegetarian staples that we can cook using our own recipes. With the addition of cooking oil, this supply provides most of the recommended calories-per-day. Because only one of the three products provides a full 2,000 calories-per-day, we decided to add a few Supplemental Food Supplies for variety and to increase the calorie count to over 2,000 per day for six people for six full months. The FDA uses a 2,000 calorie per day diet as a benchmark. However you can learn about your personal requirements, based on age, weight, and activity level here. 1 Wise 480 Serving All Meat Supply. 66,080 total calories. 1 - Saratoga Farms Dessert 6-Can Case. 38,140 total calories. At Food Storage Guys, the entire process of selecting the right food for our storage needs was simple and easy thanks to the Food Calculator and the fact that total calories and calories-per-day are listed on all of the Primary Food Supplies they sell. It made comparing supplies from different manufacturers a snap. Once we had decided on our food storage needs, we still had to determine other survival necessities such as water, power, communication, heat and shelter, in case we are unable to stay in our home during an emergency. Getting prepared for "anything" is really a goal that's impossible to reach. The fact is that there are so many different disaster scenarios, it's impossible to be 100% prepared for all of them. But that's no reason to throw up your hands and give up. 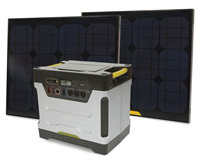 There are certain necessities, without which survival could be threatened during any emergency or disaster. Our plan is to have these necessities available along with a good understanding of situational awareness and, most importantly, a survival mindset. Surviving a disaster may require that you be completely self-sufficient. The easiest way to get started with a plan to become self-sufficient is to answer a few basic questions regarding your personal situation. What are the basic needs for human survival? What do you believe is the most likely emergency or disaster that could effect you? These emergencies can range from a few days without power, in the case of an ice storm or blizzard, to 5 years or more, in the case of an EMP taking down the entire power grid. As we stated earlier, it's nearly impossible to be prepared for all of the various emergency scenarios but we want to have the ability to be self reliant during the most likely short or long-term events. Thinking about what we believe to be the most lilely scenarios, breathable air will probably not be an issue so we're putting that one on the back burner until the others necessities have been covered. Drinkable water is more likely to be in short supply. As a rule of thumb, we've learned that at least 1 gallon of water per day, per person will be needed. That will cover drinking water and sanitary needs. For short-term emergencies, we decided to store eighty gallons of water. That's enough for roughly two weeks for the six people in our family. The easiest and most convenient way we've found to store that much water was to purchase two 40 Gallon Stackable Water Container Kits. These are great because each stackable brick holds only 5 gallons which is fairly easy to move where it's needed. We get lots of rain in our area so, for the moment, our long-term plan is to simply reroute the gutters on our roof into two 55 gallon drums. If we use rainwater to max out our storage when it rains, we'll have 190 gallons of water which will last our family about a month. Ultimately, our long-term plans include moving to a more remote location and putting in a well. We're also looking for land with a running stream. Until we find the right spot however, the water storage option will have to suffice. Another factor is to insure that the water we drink is clean and free of bacteria, parasites and harmful chemicals. After speaking with other preppers through online forums, reading lots of prepper blogs and doing some research, we decided to get a Berkey water purification system. It removes all of the bad stuff from your water and one set of filters will purify more than 6000 gallons. We chose the Royal Berkey because it's built of stainless steel for many years of use and it's large enough to meet our family's needs. We already have appropriate clothing for all four seasons so we won't go into too much detail about that except to say that what works in some parts of the country won't work in other parts. You know the weather in your area so be sure to have clothing that will protect you year round. As for shelter, we live in a suburb about 15 miles from a major city. Our house is not on a flood plain and we have about half an acre of land. As mentioned earlier, our long-term plan is to buy a larger piece of land in a more remote location where we can put in a well and perhaps even an underground shelter such as the Atlas Bomb Shelter. We're not going to wait until then, however, to get our other needs satisfied. In the meantime, we're getting stocked up with necessary supplies to be able to survive in place. We're also getting to know our neighbors better and discussing emergency plans with those who are open to the subject. Having a group of like minded individuals nearby is one of the most important preparations we can imagine. In the event that our home becomes uninhabitable, we want to have other options. Though we haven't yet prepared for that contingency, we have been researching a few alternatives. The best we've found so far is to purchase a used travel trailer. These units are self-contained with a refridgerator that runs on either electricity or propane gas, built-in gas stove/oven and a toilet. We could pull a trailer to a better location (including a more remote piece of land when we find it) and it will protect us from the elements allowing us to survive in relative comfort. One more option that is much less expensive than the trailer is to purchase a canvas wall tent and wood burning stove. There are some really good deals for these items on the Food Storage Guys website. We have already purchased the food we will need to weather any emergency from three days to six months. Our selection and reasoning is mostly covered in the first part of this article. However there are a few things we bought in addition to what we mentioned. In case a disruption of our food supply lasts more than six months, we'll need to be able to plant a garden for long term survival. To that end, we have purchased two cans of the Survival Seed Bank - Endless Garden. These non-GMO seeds will allow us to plant a garden and replant it year-after-year until the crisis is resolved. We already have the hand gardening tools we'll need. There's enough to learn about planting gardens to fill several more articles so maybe we'll come back to that at another time. Finally, we bought a Victoria 4 Tray Seed Sprouter. If we have to live off of our food storage for more than a few weeks, we want to include fresh greens in our diet. Sprouts are perfect for that purpose as they take only a few days from seed to edible greens. After reading about our prepper experience, we hope you'll consider getting your family prepared for an uncertain future too. If/when the SHTF, the more of us that are ready for it, the easier it will be for all of us.